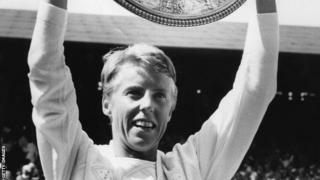 In 1969, Ann Jones won the Wimbledon women's singles title and finished the year off by becoming Sports Personality of the Year. Jones defeated Billie Jean King on Centre Court, having lost to her in the Wimbledon final two years earlier. She was the first left-handed female player to win a Wimbledon singles title. It was to be her last Grand Slam singles event, as she cut back on her playing commitments.